A network of river channels is located atop Xanadu, the continent-sized region on Saturn's moon Titan. This radar image was captured by the Cassini Radar Mapper on April 30, 2006. 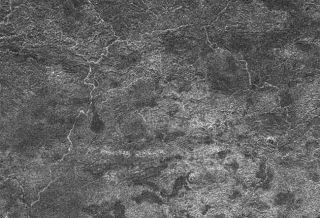 New radar images of Saturn's moon Titan revealdunes, hills, valleys and rivers that scientist say look a lot like home. But on Titan, which is frigid and shrouded insmog, the features are likely carved in ice rather than solid ground. The detailed view is of a bright area on Titancalled Xanadu.It's about the size of Australia and has been studied from afar for years. Nowscientists are getting a better look with NASA's Cassini spacecraft. Radar is bouncedoff the surface to generate an image that cannot be made using visible-lightobservations because the orbiting spacecraft can't see through the moon's thickatmosphere. The observations reveal mountains about as highas the Appalachians. "Surprisingly, this cold, faraway regionhas geological features remarkably like Earth," said Jonathan Lunine, aCassini researcher at the University of Arizona. The river channels are likely carved by liquidmethane or ethane, as the moon is too cold for water to be liquid. "Although Titan gets far less sunlight and ismuch smaller and colder than Earth, Xanadu is no longer just a mere brightspot, but a land where rivers flow down to a sunless sea," Lunine said. Liquid methane might fall as rain or tricklefrom springs to create the rivers, Lunine and his colleagues figure. Perhapsthe rivers carry grains of material that accumulate as dunes elsewhere. "This land is heavily tortured, convolutedand filled with hills and mountains," said Steve Wall, the Cassini radarteam's deputy leader at NASA's Jet Propulsion Laboratory. "Xanadu has beenwashed clean. What is left underneath looks like very porous water ice, maybefilled with caverns."